I guess it is about time to start on Friday PhotoEssays for the year! There isn’t much going on yet, but there are a few things to share. I will say that the Friday PhotoEssay posts may be a little few and far between this spring, as I’m planning to be out of the office more often than not. We may end up doing PhotoEssays whenever they come rather than on Friday! The garden looks very much like it did last fall after we finished up, which is fine. 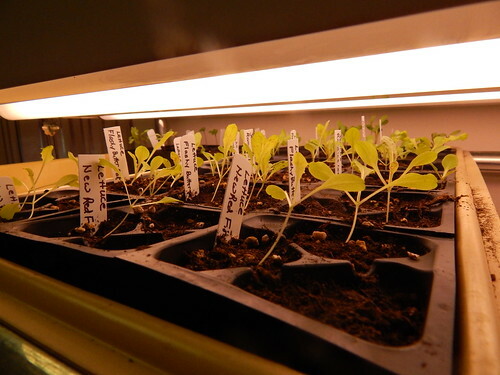 We have lettuce seedlings up and growing inside though! They are already looking a little bit stretchy. I’m tempted to put them outside, but I think they are a bit too small yet. Next week for sure! 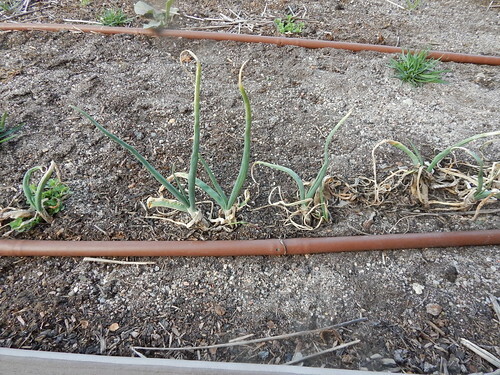 I had left a few of these ‘Deep Purple’ bunching onions outside last fall when the first cold spell hit, completely unprotected. I wanted to see what would happen, and I thought they were completely dead. Deader than dead. But I was wrong! It is always amazing to me how resilient plants can be! 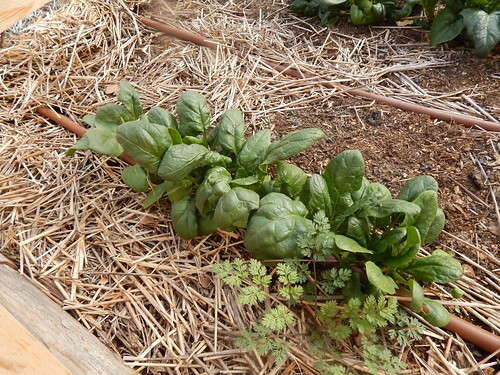 This spinach was planted fairly late last fall. I think early October? It was really small when the cold weather hit, so I didn’t even bother covering it. 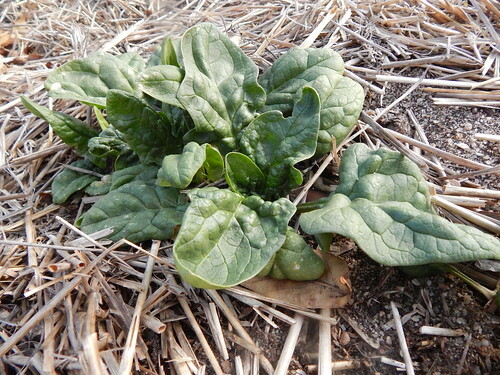 This spinach has had NO protection all winter. It is now a nice size and lush. Very little signs of damage. 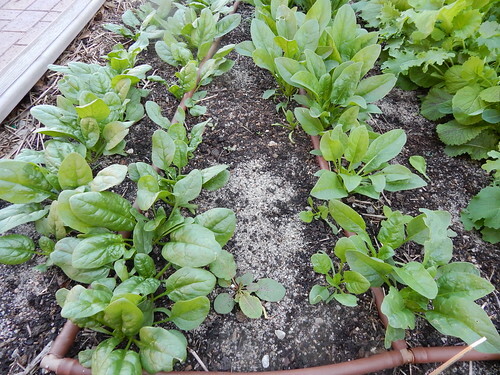 This spinach was planted at about the same time as the previous picture, although perhaps a week earlier. 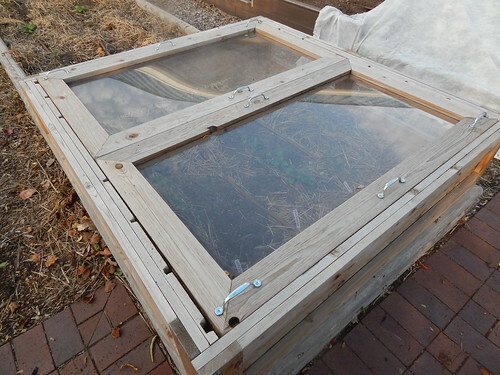 It was larger last winter, and we ended up putting the cold frame over it. 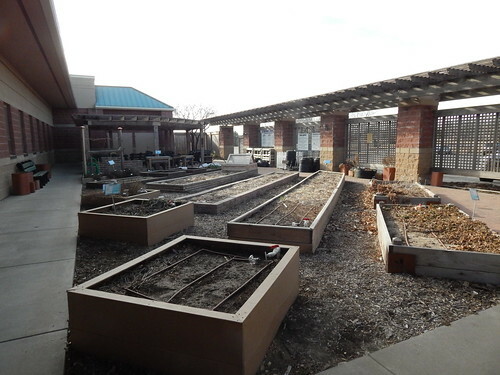 The cold frame was kept closed all winter until late last week. Again, this spinach looks great! This spinach was the largest last fall, and had been harvested a couple times already. 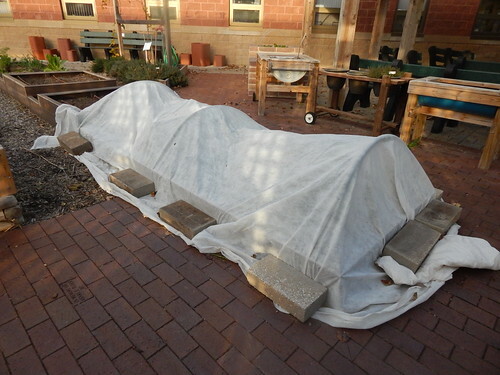 I put it under the row cover for the first couple cold spells, but then took it off and left it off for the rest of the winter. 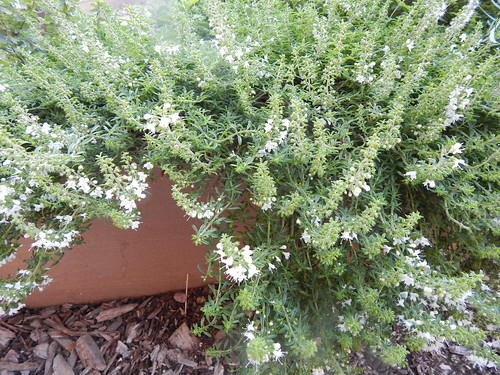 There are also two different varieties. The one on the right is ‘Giant Winter’ and the one on the left is ‘Donkey.’ It isn’t as obvious in the picture as in person, but the ‘Donkey’ spinach looks a lot better. I’m curious as to whether being under the row cover early resulted in these plants being more susceptible to cold injury later or if it is simply the fact that the plants were larger when the cold hit. 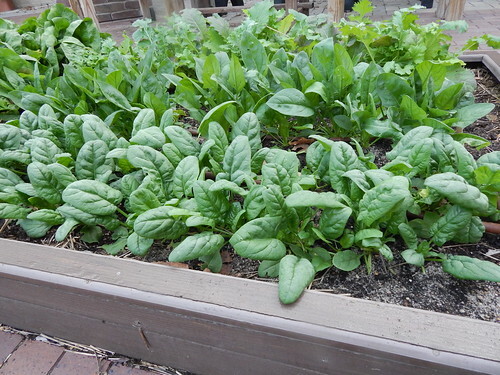 Because clearly, the earlier picture of completely unprotected spinach shows no damage. 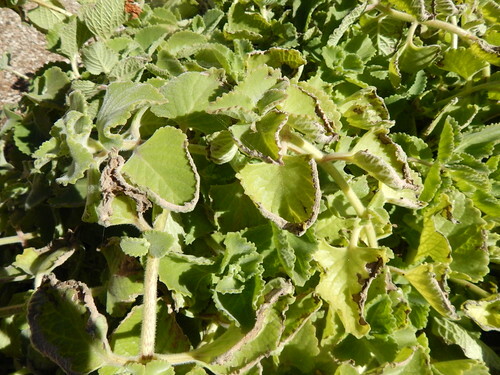 However, those plants were much younger and smaller all winter. I think they have put on a lot of growth in the last couple weeks. It would also have been interesting to see what these plants would have looked like if they had been harvested heavily at some point during the winter. 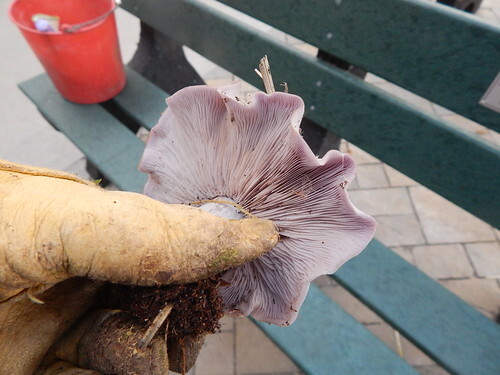 Overwintering vegetables sometimes causes more questions than answers! 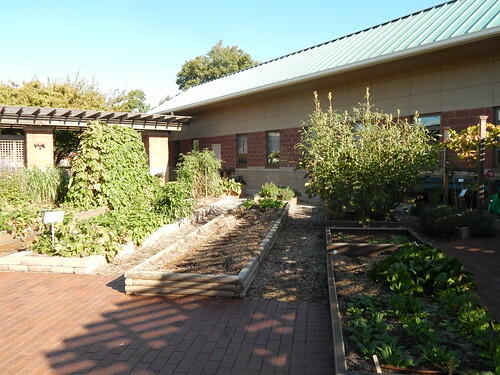 On a completely different topic, I would like to point you all toward a blog post by one of our Master Gardeners, Cynthia Abbot: Tolerating the Uglies, Take 2. 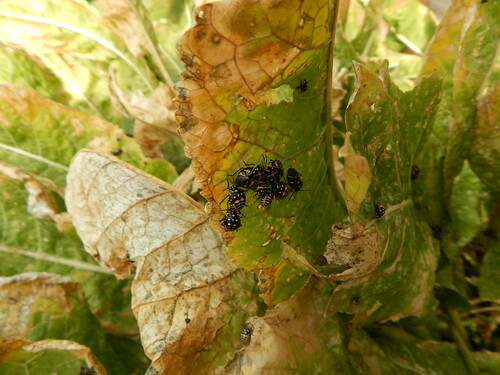 I know you are probably not thinking about blister beetles on your tomatoes yet, but you should read her post on the subject and tuck it away for later this summer! I feel like I spend a lot of time on this blog talking about the weather, but it really isn’t just idle conversation! 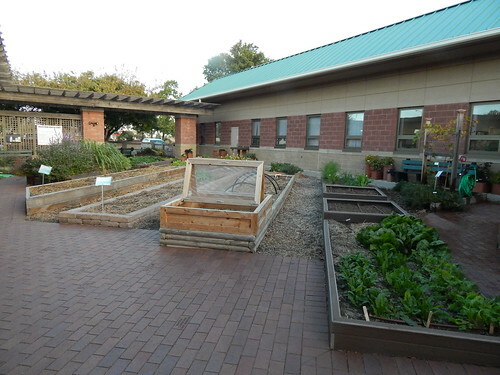 The weather is extremely important to our success as gardeners. After one light freeze and lots of unseasonably warm weather, we are looking at more than a week of unseasonably cold temperatures. Overnight lows look like they will be hovering in the upper teens to low 20s for the better part of the next two weeks. (At least that low of 9 degrees is gone, for now!) 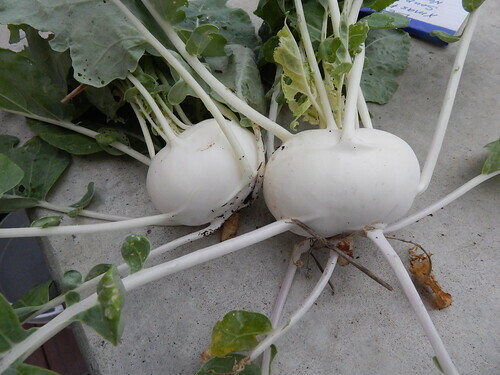 Many of the cool season vegetables will tolerate temperatures down to 24 or 25 without significant damage, but two weeks of lows down around 20 is probably a bit much for them to tolerate, especially when they haven’t been hardened off with cold-but-not-too-cold temperatures. 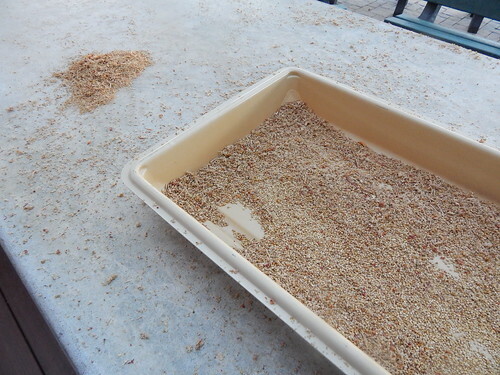 So…it was time to harvest some things and cover others this afternoon! Because I can’t resist experimenting, I left one or two plants of almost everything in the garden, just to see what would happen. We already had the cold frame out, but still open. We closed it up and tucked some straw along the back edge to keep the cold air out. 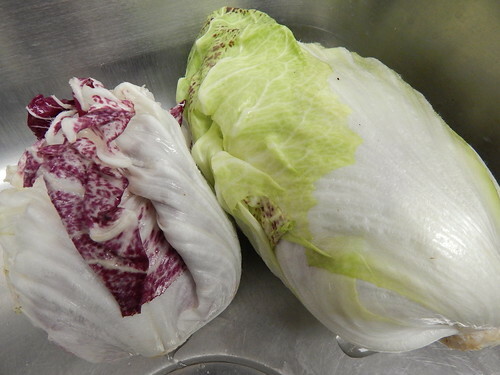 We also put hoops and row cover over the main section of spinach and radicchio. Normally I’d leave those out, but I think this will be a bit cold all of a sudden. 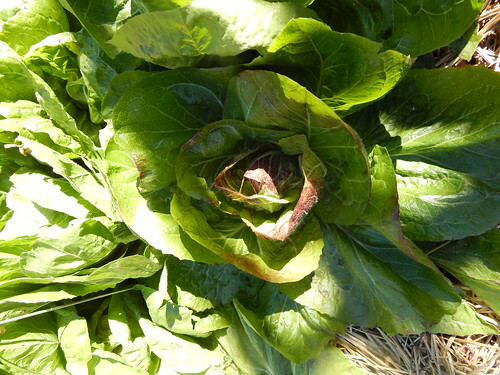 I harvested a few of the radicchio plants to see what stage they were at. 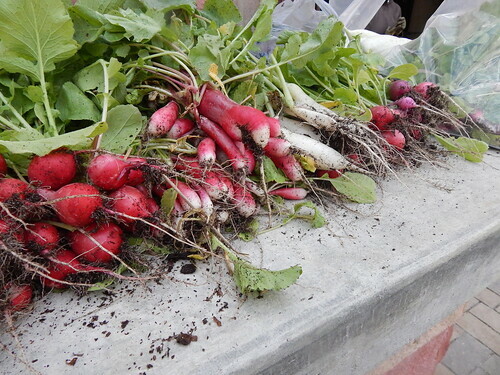 I also harvested the watermelon radishes, fennel, half the bunching onions, and most of the dandelion greens. I was just going to leave the lemongrass, but then I just couldn’t let it go to waste, so it went to our Foods & Nutrition department. I’ll post more pictures and show what I did with some of the different vegetables later in the week! That would be the spinach that isn’t a fan of the crazy weather! 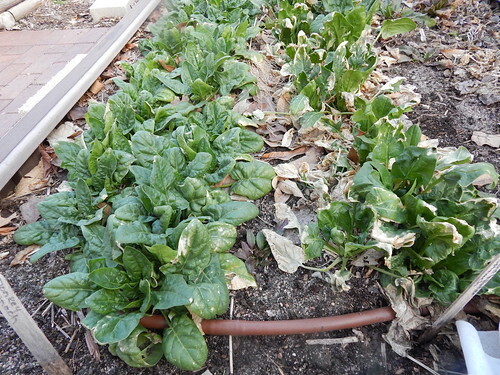 This is the ‘Bloomsdale’ spinach that was supposed to be more bolt tolerant…or not. 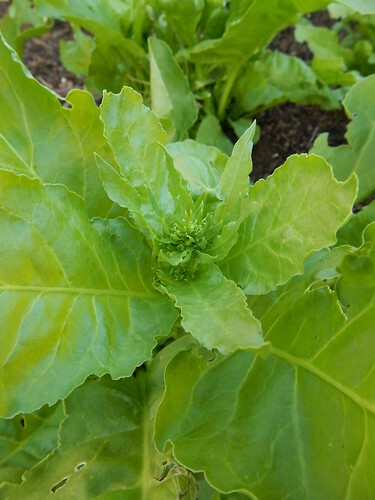 To be fair though, when the temperatures bounce around like they have been this spring, it does tend to initiate blooming/bolting in leafy greens more often than not. When we harvested last week, I saw that some of the leaves were starting to get more pointy, which is often an early sign of bolting. This week there were a couple of the plants in full flower, like shown here. 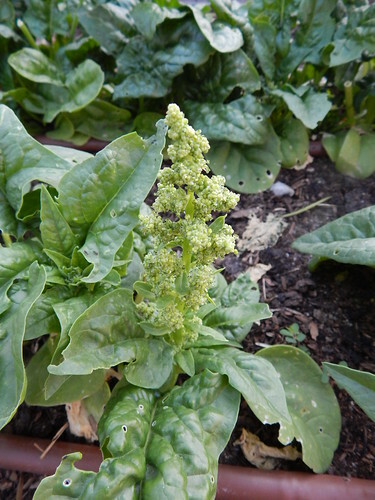 The ‘Sagar’ Spinach in the Taste of India garden wasn’t quite as far gone, but you can see here the initiation of the flower bud. 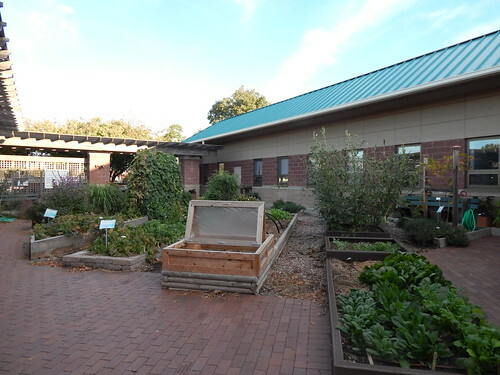 We harvested the good leaves off of both patches of spinach this week and then removed the plants. 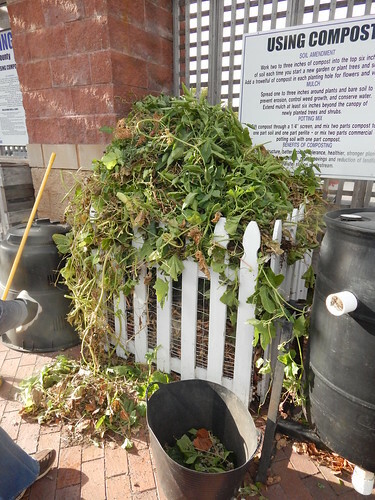 We also harvested the rest of the romaine lettuce and a good bunch of the mustard greens!